Starting on Jan. 1, 2015, all employers under federal OSHA jurisdiction will be required to report not only all work-related fatalities within eight hours, but also in-patient hospitalizations, amputations and loss of an eye within 24. 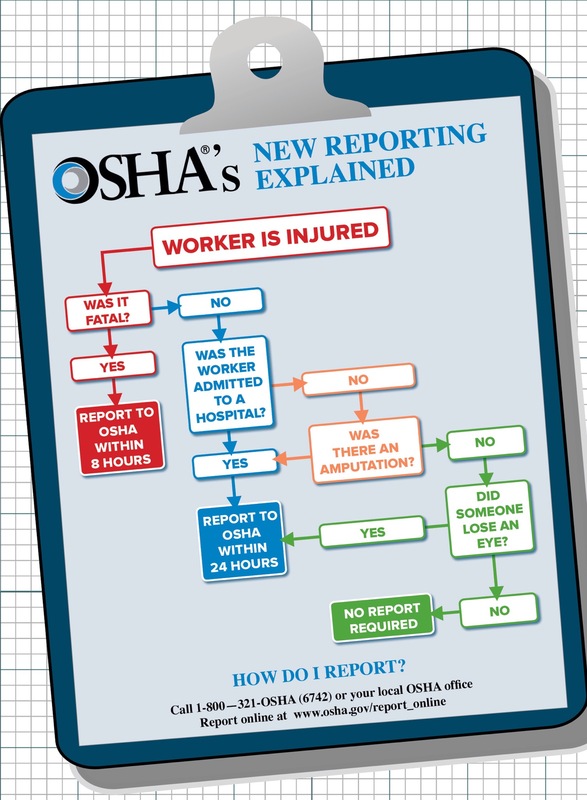 Previously, employers were only expected to report after a fatality or when three or more workers were hospitalized in the same incident. Illinois’ Hydraulic Fracturing Regulatory Act (HFRA) is a law that applies to all wells in which high-volume, horizontal hydraulic fracturing (fracking) operations will take place in Illinois. The Illinois Department of Natural Resources (DNR) regulates the oil and gas industry and has primary authority to administer the HFRA with the assistance of the Illinois State Geological Survey, the Illinois State Water Survey, the State Fire Marshal and the Illinois Environmental Protection Agency. The HFRA is found here. Every applicant for a permit under the HFRA shall first register with the DNR at least 30 days before applying for a permit. If you would like to register or learn more, Instructions and Registration Process are provided. Comments are required on the US Federal Clean Power Plan Proposed Rule by October 16, 2014. The Proposed Rule will establish state-level Carbon Pollution Emission Guidelines for Existing Stationary Sources: Electric Utility Generating Units. The US Federal Environmental Protection Agency (USEPA) is proposing emission guidelines for states to follow in developing plans to address greenhouse gas emissions from existing fossil fuel-fired electric generating units. Specifically, the USEPA is proposing state-specific rate-based goals for carbon dioxide emissions (per megawatt hour of electricity produced) from the power sector, as well as guidelines for states to follow in developing plans to achieve the state-specific goals. This rule, as proposed, would continue progress already underway to reduce carbon dioxide emissions from existing fossil fuel-fired power plants in the United States. The plan aims to cut the emissions of the US power sector 30 per cent on 2005 levels over the next sixteen years. The USEPA aims to have final rules in force by June 2015. States will have until 30 June 2016 to submit plans explaining how they will meet this target. States may plead for up to two years’ extra time. The proposal covers emissions from 1,600 existing coal and gas-fired power stations across the US. Regulations limiting emissions from new power stations are already in the pipeline. Information about the proposal is found here. New vehicle emission and lower fuel sulphur standards were agreed March 3rd 2014. These will come into force in 2017. “Control of Air Pollution from New Motor Vehicles: Tier 3 Emission and Fuel Standards” (or “Tier 3”) are developed by the U.S. Environmental Protection Agency (USEPA) under the US federal Clean Air Act (CAA). The current USEPA’s Tier 2 Vehicle and Gasoline Sulfur Program, which was finalized in February 2000, took a systems-based approach to motor vehicle pollution by setting standards for both passenger vehicles and their fuel (gasoline). The program set stricter tailpipe and evaporative emissions standards for criteria pollutants from vehicles beginning with model year 2004 and phasing in through 2009. The program also lowered the sulfur content of gasoline to a 30 parts per million (ppm) refinery average, 80 ppm per-gallon cap, and 95 ppm downstream cap; beginning in 2004 and phasing in through 2008. The potential to extend the phase-in for small refiners and approved Gasoline Phase-In Area refiners through the end of 2010 was provided in the Highway Diesel Rule (66 FR 5136, January 18, 2001) in exchange for early compliance with the diesel program. Similar to the Tier 2 rule, the new rule “Control of Air Pollution from New Motor Vehicles: Tier 3 Emission and Fuel Standards” (Tier 3) is a comprehensive, systems-based approach to address the impact of light-duty vehicles on air quality and health. The Tier 3 rule establishes new standards for light-duty vehicles and new fuel standards for gasoline (including a 10ppm sulphur standard). The Cross-State Air Pollution Rule (CSAPR, 2011) replaced and strengthened the 2005 Clean Air Interstate Rule (CAIR), which the U.S. Court of Appeals for the D.C. Circuit ordered EPA to revise in 2008. The court had allowed CAIR to remain in place temporarily while EPA worked to finalize the replacement rule. EPA information on the CSAPR and CAIR is here. December 10, 2013 – the Supreme Court heard oral arguments in EPA’s appeal from the vacatur (order to set aside or annul a proceeding) of the Cross-State Air Pollution Rule (CSAPR) in EPA v. EME Homer City Generation, L.P. Specifically – the Clean Air Act, 42 U.S.C. 7401 et seq. (Act of CAA), requires the EPA to establish National Ambient Air Quality Standards (NAAQS) for particular pollutants at levels that will protect the public health and welfare. 42 U.S.C. 7408, 7409. “[W]ithin 3 years” of promulgation of a [NAAQS],” each State must adopt a state implementation plan (SIP) with “adequate provisions” that will, inter alia, “prohibit” pollution that will “contribute significantly” to other States’ inability to meet, or maintain compliance with, the NAAQS. 42 U.S.C. 7410(a)(1), (2)(D)(i)(I). If a State fails to submit a SIP or submits an inadequate one, the EPA must enter an order so finding. 42 U.S.C. 7410(k). After the EPA does so, it “shall promulgate a [f]ederal implementation plan” for that State within two years. 42 U.S.C. 7410(c)(1). In 2011, the EPA finalized a rule known as the “Transport Rule”, the CSAPR. Mirroring the language of the “good neighbor” provision, the Transport Rule defines emission reduction obligations for several upwind states that “contribute significantly” to downwind states’ nonattainment of the EPA’s air quality standards. In determining what constitutes a significant contribution, the EPA balanced achievable emission reductions against the cost of achieving those reductions. However, in EME Homer City Generations v. EPA, the D.C. Circuit struck down the Transport Rule and rejected the EPA’s analysis for determining what constitutes a significant contribution in this context. In December 2013, the Supreme Court was presented with questions about the EPA’s interpretation of its statutory grant of authority under the CAA as well as questions about the jurisdiction of the D.C. Circuit to hear the challenges presented. This case also raises concerns about federal intervention in state affairs and public health concerns posed by the EPA’s interpretation of the CAA. Should the Supreme Court decide this case on the merits, the Court’s decision will significantly affect the EPA’s grant of authority to regulate interstate pollution. The information set out below is informed by the article by Stephanie Sebor, Winston & Strawn LLP, here. The state respondents, lead by Texas, argued that the EPA had directed the states in the 1998 NOx SIP Call not to submit interstate transport SIPs until after EPA had quantified each state’s good neighbor obligations, which excused the states from the requirement to adopt a SIP until after EPA completed its quantification. The Court’s decision is expected by June 2014. If the Court splits 4-4, the effect would be to uphold the D.C. Circuit’s vacatur of CSAPR.